On Jan. 7, someone strolled into a supply room at Camp Eggers, a coalition base near the U.S. embassy in downtown Kabul, pocketed two sets of car keys and walked out undetected. Sometime over the next 24 hours, the thieves drove away with two black-painted, armored Toyota Land Cruisers belonging to the U.S. Army's 26th Maneuver Enhancement Brigade, a unit that escorts coalition personnel around Kabul. The loss of the Land Cruisers is bad enough. 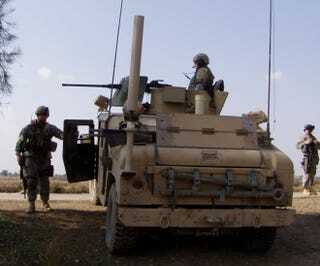 But what's really got the Army worried is what was inside the vehicles: two sets of top-secret Duke radio frequency jammers used to block the signals that detonate remote-controlled Improvised Explosive Devices. In a notice posted to the Website of the Army's Criminal Investigative Command (and first noted by Military Times), investigators plead for anyone with knowledge of the theft to contact CID offices in and around Kabul. If the Army suspects who might be responsible, it's not saying. Equally, it's not clear if the bandits were after the Duke equipment specifically, or if the Land Cruisers were the sole target and the jammers were simply bonuses. Best case scenario: the thieves have no ties to insurgents and no appreciation of the jammers' value … and the high-tech devices wind up in a scrap heap somewhere. Worst case: the jammers wind up in the hands of insurgents who then reverse-engineer them to create some kind of counter-counter-measure, thus making already-deadly IEDs even more dangerous. The principle at work in the counter-bomb devices is simple: they emit a powerful radio signal that essentially drowns out other radio signals, including detonation commands. Early jammer models, such as the Warlock (pictured), had a tendency to wipe out everybody's communications for hundreds of yards in all directions. They could even cause remote-controlled drones flying overhead to crash. Newer jammers including the "Duke" model are more selective in their jamming, although they can still kill your cell phone signal if you're close enough. It's the secrets of this selectivity that the Army probably values the most, and which are at risk in the Kabul theft. That said, radio-command IEDs are not the major bomb threat in most parts of Afghanistan. Rather, most bombs are detonated by pressure-plate triggers or metal command wires, against which jammers are useless. Moreover, the Duke is not the most modern jamming device; that honor belongs to the CVRJ - the CREW Vehicle Receiver/Jammer. The Duke itself gets updated every couple years. It's now in its "V3″ edition. Which is to say, even in the worst-case scenario, the Army's multi-billion-dollar efforts to defeat IEDs is not entirely compromised by the jammer loss. But that doesn't make the theft any less embarrassing for the world's leading ground force.